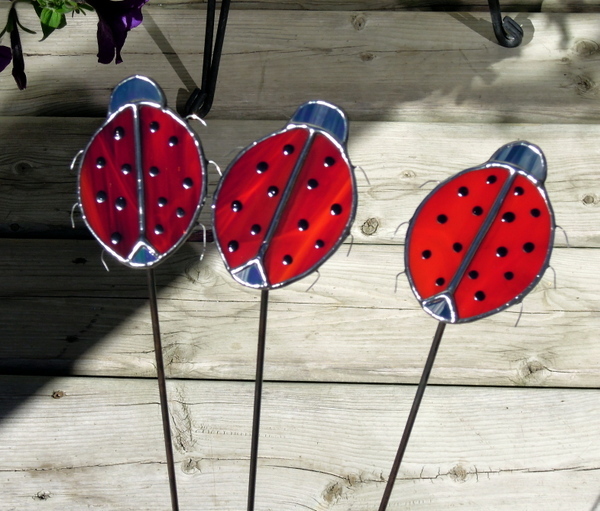 Everyone likes Lady Bugs and here we have attached them to a 2 ft metal rod for display in your flower beds or garden. These Lady Bugs measure approximately 2.5 x 3 inches. We use #22 gauged tinned wire for their legs, and once finished with black patina, cleaned with Kwik Clean and polished with Clarity Stained Glass Polish, we then paint the black spots on using black nail polish. As with our Garden Butterflies these also gently rock in the wind and withstand very well our Central Alberta summer weather conditions.